A naked rambler has been locked up again after falling foul of the law in the Scottish Highlands. Stephen Gough, who has already been arrested numerous times during his clothes-free ramble from Land's End to John O'Groats, was back behind bars again on Wednesday evening. And when he appeared at Dingwall Sheriff Court in the Highlands on Thursday, Honorary Sheriff David Neill placed him on remand until a trial on 3 October. Gough, who was wrapped in a pink quilted blanket, was branded self-indulgent and obsessive. 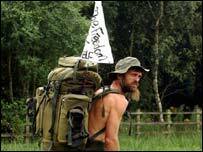 The former Royal Marine, from Eastleigh, in Hampshire, has been walking the length of Britain wearing nothing more than a bush hat and a pair of boots and carrying a rucksack. The trip is a protest against what he sees as antiquated attitudes towards nakedness. He pled not guilty to breach of the peace while under bail orders from sheriff courts at Duns, Perth and Inverness. Duty solicitor David Hingston said Gough wanted bail, however, procurator fiscal Roderick Urquhart opposed this. He told Sheriff Neill: "You will see he is subject to three bail orders at the moment, and the problem is the likelihood of repetition. "He has made it clear already, and I think he has made it clear to police today he intends to continue with this self indulgent and rather obsessive course of conduct. "He believes he ought to have the right not to wear clothes, so he therefore feels he does have that right. "Mr Gough wants his perception of his rights to prevail over the rights of the public not to be alarmed by people wandering around naked in secluded areas or in public." 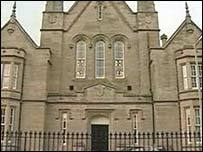 The sheriff refused bail and remanded Gough to Inverness Prison pending an intermediate hearing on 18 September and an October trial. He told Gough bail was refused because of his "repeated unwillingness to comply with bail orders as stated today". After being released on bail from Inverness Sheriff Court earlier this week, Gough said: "I am going to continue with my naked walk and the campaign for naturists and human rights. "I am not breaking the law in my eyes, and I am innocent until proven guilty."